A car valet took a Mercedes he was working on and crashed causing more than £5,000 worth of damage. James Buchan wrote off the Mercedes C180 and also a Vauxhall Astra he hit, in addition to demolishing a garden wall. Buchan, 32, of Lancaster Road, Marton, pleaded guilty to the aggravated taking of a car without consent and failing to stop after an accident. He had previous convictions for taking a car. 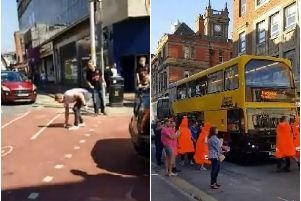 He was sentenced to eight weeks jail suspended for 18 months, told to do 200 hours unpaid work for the community, disqualified from driving for two years and ordered to pay compensation of £200 to the Mercedes owner plus £100 to the wall owner by Blackpool magistrates. Prosecutor, Pam Smith, said Buchan had valeted the woman’s cars for two years and when it was noticed one of the Mercedes alloy wheels was damaged Buchan was given permission to drive it to a garage and bring it back. He took the car on April 7 but did not bring it back. On April 8 at 3.25pm people living on Starbeck Avenue, South Shore, heard a huge bang. A Vauxhall Astra parked on the street had been hit by Buchan and shunted 15 yards down the road and a garden wall had collapsed. Witnesses saw the Mercedes driving away, leaving a groove in the road. The Mercedes owner said in a victim’s impact statement she was unable to get to work 100 miles away and lost earnings of £1,500 a week. The insurance company would not pay out in full on her car and there was a shortfall of £4,525 which the loan company wanted her to pay quickly. She had not been sleeping through worry about her financial situation and had nightmares and panic attacks. Stephen Duffy, defending, said Buchan drove the car to the garage but it had closed early for the day. Instead of taking the Mercedes back to the owner he decided he visit a friend in St Annes. They had some drinks in a pub there and he left the car overnight in the pub car park. The next day he was driving the Mercedes back with three passengers on board when he swerved on Starbeck Avenue and crashed. The defence added that Buchan had a business insurance policy which could be claimed on by the owner of the damaged car. Graeme Foy, who also repeatedly punched the officer in the head, ended up being sprayed in criminal identifying red dye by his victim. Foy, 32, of Cedar Walk, Featherstone, West Yorkshire, who is a trainee funeral director and embalmer, pleaded guilty to assault. He was sentenced to a 12-month community order, ordered to do 200 hours unpaid work for the community and told to pay £300 compensation with £85 costs plus £85 victims’ surcharge by magistrates. Prosecutor, Pam Smith, said the door supervisor at the resort’s Imperial Hotel, Talbot Road, saw Foy aggressively bouncing about in the bar on April 15 and told staff not to serve him any more alcohol. Foy came towards the exit and the security officer ushered him out and asked him to move away. Foy then lunged to bite the officer and one of his teeth caused a small wound on the doorman’s hand. After the officer sprayed him with criminal identification red dye, Foy punched him several times in the head. Martin Hillson, defending, said Foy had been a licensee in Blackpool and was in the resort to visit relatives and friends, many of whom were licensees. Foy, who had also served as a medic in the Army, had only three drinks and then shared a cigarette. He felt the cigarette must have had drugs in it, because after smoking it he had little recollection of what happened. Foy felt genuine remorse and apologised to the victim and police. A woman was remanded in custody after shouting at magistrates that she did not want bail. Bethany Pirie was appearing before magistrates via the video-link from Styal Prison. Pirie, a 22-year-old mother, of no fixed address, is accused of stealing a television and mobile phone valued at £1,185 from a relative at Fleetwood. She is also alleged to have stolen a mobile phone, X-box controller and games costing £260 from another relative in Fleetwood. Defence lawyer, Gerry Coyle, said his client had bi-polar disorder. Pirie was then remanded in custody to June 9. A man accused of assaulting three women has been banned from entering a Blackpool nightspot. Liam Swayne, 25, of Woodfield Road, South Shore, is also alleged to have behaved in a threatening behaviour. Swayne was bailed by magistrates on the condition he did not enter the Chaos nightspot. A man has made his first appearance at court accused of having cocaine to supply in Poulton. Marcus Raynor, 28, of Clifton Drive North, St Annes, is alleged to have committed the offence on October 19 last year. Defence lawyer, David Charnley, said his client would not indicate a plea to the offence at that stage. Raynor was bailed to appear at Preston Crown Court on June 7 by magistrates. A man accused of throwing his wife’s television against the wall has appeared at court. Nathan Price, aged 20, of Common Edge Road, Marton, pleaded not guilty to causing £150 worth of damage. He was remanded in custody towards June 23 for trial by magistrates.